Evernote. I know, you must be getting tired of me writing about Evernote. I can't help it. It is an incredibly useful, easy to use, and once you start you have no idea how you lived without it, free resource that I use for literally everything. Evernote has apps for mobile devices, desktop software, and you can access your notes through any web browser. I talk about it on this blog a lot, I share about it on Twitter and Google+, and I teach other teachers and my students how to use it. Evernote has some great resources for using it and lots of educators have created resources for using it, but Evernote has just announced "Evernote For Schools Site: Resource for Using Evernote in Education." 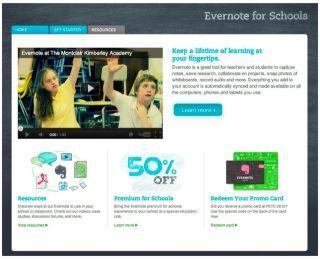 Evernote for Schools is a micro site on the Evernote page that has useful resources to help educators and students use Evernote more effectively as an education tool. It has a collection of resources including education-related case studies, videos, and a discussion forum for connecting and sharing tips and ideas for using Evernote in a school setting. Teachers can use Evernote to organize notes, lesson plans, lesson resources, student reports and notes, and research. Students can use Evernote to organize all their content (notes, projects, worksheets, lists and more) on all the computers, phones and tablets they use, at school and at home. There is an Evernote for Schools Discussion Forum where educators share tips, tricks, resources and best practices and you can follow the Evernote for Schools Twitter account, @evernoteschools, to keep up to date on new developments, upgrades, news, tips and much more. If you use Evernote, this site can help you use it more effectively. If you don't use Evernote, this page will help you get started using Evernote in education.